What makes our new commission and Mahler Nine so special? 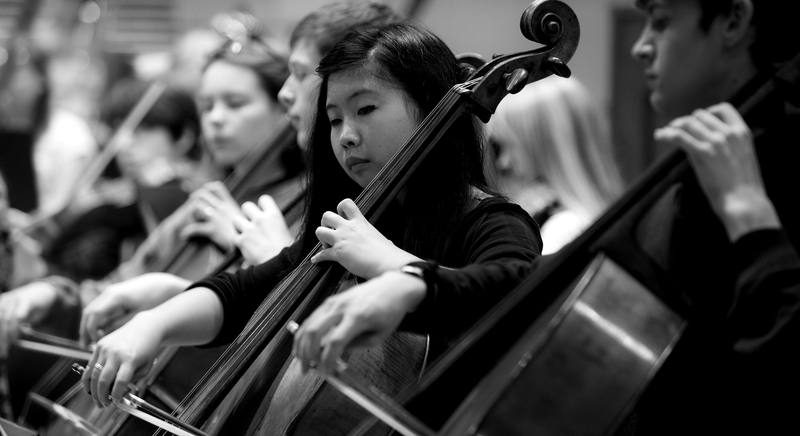 A luminous, mesmerising energy makes every concert by the world's greatest orchestra of teenagers thrilling. Re-greening, written by Tansy Davies especially for this brilliant orchestra, is performed without a conductor and completely from memory. With ritualistic focus the musician’s move, sing and play, visceral connections are made and musical currents crackle from player to player, awakening an ebullient Spring from her long Winter slumber. Following it, Mahler's awesome, 'affirmative love-song to life' performed by 160 twenty-first century teenagers committing themselves totally to its turbulence and radiance will be a transforming experience. engulfs the senses. Sometimes joyful and exuberant, sometimes brooding and mystical, it is always an exhilarating ride. It's the perfect music then, for an orchestra of teenagers with bucket loads of spirit and a hunger to share their passion for music with everyone. Free from the usual stage confines, the musicians are in full focus for Re-greening. With exquisite playing they send reverberations straight from the heart to the ground below, summoning up new life. Mahler's Symphony No. 9 is consuming in its emotional intensity and these inspiring musicians pour themselves into it completely, driving through the tumult and anguish to reveal that hope will endure and life must and will go on. It is music that speaks directly to the soul. Life and all its joys and sorrows are encapsulated within it. There are moments of overwhelming grief but even at its bleakest a heart beats through the music determined to hold onto life and find joy. It will be totally uplifting, totally inspiring, totally brilliant. Come and hear it. You will feel totally alive. We brought teenage orchestral brilliance to Berlin in our pop-up performance at the city's notable book store Dussmann das KulturKaufhaus. We gave a free chamber music concert of works ranging from Schubert to Shostakovich. Tarot Reading, a set of five pieces inspired by the evocative imagery of Woodland Tarot Deck cards, which had been used as a reference point for Re-greening, our new commission by Tansy Davies. The pieces aim to capture the vivid world of these tarot cards with some affecting the music in different ways; some more literal (like mirrors and concealment) and others more elusive (atmosphere and landscape). These pieces also incorporate the sounds of the steel pan, which were introduced to the ensemble through guest teenage musician Luke Walker from Trinidad and Tobago. What inspired her when she was a teenager? Re-greening loosely follows a cycle, a Shamanic Wheel of the Year; a system with an ancient, nature-based mythology. Endless refrains, woven out of intricate, inter-connecting segments combine to form a kind of musical forest. Much of the surface music is playful, yet punctuated by explosions of new growth, rising from below, in a celebration of spring. Bursts of sound often announce new permutations of colour and texture; like a parade of windows, framing the cycles of forest life. Made from found material; two old English melodies can be heard in their original form, drifting through the work as if on a gentle breeze. Mahler’s Ninth takes us on a journey through life; from its beginning to its end. The music forces us to reflect on our own existence and what it means to be human. Some people say that all art is self-portrait. It’s easy to feel this in the case of Gustav Mahler who often told his wife that their love was enshrined in his melodies, and scribbled personal sentiments in his scores, almost as if the manuscript was his diary. Consequently, the anguished moments in his later symphonies (especially this, his last wholly completed work), we read as reflections of his daughter’s premature death and his own ailing heart condition. Leonard Bernstein, one of the work’s ardent champions, insisted that the motif which opens the symphony and recurs throughout – a little step up, a smaller step down – was the composer’s own faltering heartbeat, cast in music. As Mahler sometimes jotted words like ‘lebwohl’ and ‘abschied’, meaning ‘farewell’, in his margins, and because the drooping tail of that opening motif is the same (immensely common) step adopted by Beethoven’s sonata ‘Les Adieux’, we amateur sleuths rather regard the whole symphony as one long goodbye. But is that a fair reading of this colossal, enduring work, given fresh life today in the hands of 160-plus twenty-first century teenagers? Surely it represents more than the morbid preoccupations of a man who died a hundred years ago. We surely still play it, not just because we see Gustav Mahler in it, but because we see ourselves in it too. Listen closer to that opening motif: though the harmony around it is scarce, it’s clearly D major: such a sunny key. The harp is instructed to play it both loud and accented. A heartbeat maybe, but not a dying one. Instead, we might regard it as the very start of life, with other instruments taking it up, giving it conviction. Everything that follows seems to pour from it. It is the DNA of the symphony and, as the second violins draw it out into a melody, it’s like a child taking its first steps. Three minutes in, it is not just walking; it’s dancing. The opening motif pulses on but, flowing from it, the violins are airborne, freely plunging and pirouetting in counterpoint. If anything, this vast half-hour opening movement isn’t about death: it’s about life, and all its ups and downs. Duly, the dancing expires and several times the opening motif creeps into the darkest recesses of the orchestral palette, on growling bass clarinets and eerily muted horns. But time and again, from such obscurity, life rallies round. Nine minutes in, a new melody is sewn out of the motif, seamlessly passed between the first and second violins. We ought not to be too literal about what each little thing signifies, but if this is life’s journey, then this is courtship. Some people say here Mahler was even echoing Johann Strauss’ popular waltz entitled ‘Enjoy life!’. It escalates into a dramatic orchestral outburst where it’s hard to gauge if the urgently trilling triangle connotes ecstasy or alarm. We’ve all known emotions like that: when your feelings for friends or loved ones lurch back and forth from joy to distress. Mahler often follows an aerial violin leap with a fierce chromatic avalanche, but the music always presses on, holding fast to its little two-step mantra. After the movement’s most shattering collapse, the motif is bashed out resiliently on the timpani. Mahler is essentially hinting at the organic quality of music. It’s almost redolent of those David Attenborough documentaries where, in the face of astonishing adversity, we witness tiny creatures persist, against all odds. The first movement ends tenderly: earlier we heard two solo violins, but now there is just one. Still, it is dignified and hopeful, and finds company from a consolatory oboe half-uttering the opening motif, before everything dissolves in a miraculous harmonic halo from the strings. symphonies. A cheerful remark from bassoons and violas is answered by jaunty clarinets. They take the same falling step of the first movement motif but recast it as an almost drunken stagger, as if laughing off the solemn plight of the Andante. For a symphony supposedly obsessed with dying, we find ourselves in a major key again. Even as we swerve into more chromatic, angular material, the mood rarely darkens as much as Mahler’s earlier, more cynical Ländlers. There is none of the existential angst that brought the dancing to a crashing halt in his fifth symphony. Instead, the composer seems to be enjoying himself, painting rustic, pungent hues, adding little dabs of light with piccolo and triangle or shade with a gypsy-ish solo viola and harsh stopped horns. While writing the symphony, Mahler told a friend ‘I am thirstier for life than ever.’ Even when the party winds down and the merrymakers disperse leaving just a few solo instruments on the dancefloor, their mood never flags, upbeat to the finish. But wait: Mahler hasn’t gone soft and lost his sting. The third movement erupts with a solo trumpet triggering a frenzy of jagged gestures. It’s like a musical shark attack. Yet the assault is never as bleak as, say, the opening of the second symphony, largely due to its mercurial pace and transparent scoring – rarely is the whole orchestra used at once, but rather a molten ball of energy rockets between kaleidoscopically-changing small groups. The acidity is pronounced as Mahler jack-knifes between short lyrical snatches and shrill chromatic gasps: it’s like he wanted to show the goblins lurking beneath the golden veneer of Vienna. He inscribed the score ‘to my brothers in Apollo’ which some take at face value, but others think he sarcastically meant the Austrian music critics who claimed he couldn’t write good counterpoint – this being his deliciously OTT rebuff. Indeed, he calls it’s a burlesque, drawn from the Italian ‘burla’, meaning ‘to mock’. But loftier thoughts take root. Midway, as in his sixth symphony, Mahler almost rips open the commotion and momentarily gives us a glimpse of music yet to come: in this case, the trumpet – now chastened – singing the radiant theme of the finale. Yet the idyll is upturned by heckling clarinets and the frenzy resumes, a whirlpool spinning faster and faster. When John Barbirolli came to record the symphony, he did the last movement at night, saying ‘such music should not be played in the daylight.’ Throughout, the strings sing – often in unison – an almost endless hymn-like melody, reminiscent of the kind that Bruckner wrote. It is tremendously expressive, surging several times to a fervent climax, that falling step from the start of the symphony stockpiled atop itself in steadfast defiance. Even here a major key mainly prevails: if in the end this really is some sort of goodbye, it is the fondest of farewells. At its close, Mahler quotes his own Kindertotenlieder (Songs on the death of children) – another totem, some say, of the work’s deathly obsession. But the phrase he quotes was originally sung to words remarking on the beauty of sunlit hills. Alban Berg said the symphony wasn’t about death, but the urge to live in peace, fearless of when the end may come. Listen beyond the dying strings at the very end, and you’ll faintly hear the violas persevere: their last phrase echoing the heartbeat motif from the very start. Life goes on. The following summer, Mahler would sit down and start his tenth symphony – a piece he would never finish but still it begins with those same violas, striding on into a new dawn. Music, for Gustav Mahler, was life. The Ninth is his testament to its enduring spirit.